The first third of the movie is introducing us to Megan and introducing Megan to the Marine Corps. The obligatory boot camp scenes went by fairly quickly, some humour, but also quite effective at keeping the audience connected to Megan. Kate Mara was good as Megan. She’s a petite woman, but has a quiet strength about her, and handled herself well in the extreme and unfamiliar environment around her. Mara also has really expressive eyes and did great with scenes of bewilderment, fear and surprise – emotions that you don’t always see in members of the Armed Forces, but ones that the audience expects and can appreciate. The middle third of the movie was anchored by everything that makes the movie great. Might as well begin with the main plot: Megan is trained as a dog handler, of course the most vicious and unruly dog, but she’s just going to sit there and talking to it until it starts to listen to her. Megan’s bond with her dog Rex is the main point of the movie, and the emotional core, and it really is the movie’s strength, but it’s also everything else around it at the heart of the movie that works so well. Megan and Rex are fairly quickly thrust into war. And I loved the war scenes – all of them, from the intensity of hunting out bombs that could easily kill them to the jovial fraternity back at camp. It’s movies like Megan Leavey and American Sniper that are about more than just war that have really effective war scenes. Despite the very large American flag adorning most of the promotional material for Megan Leavey, it isn’t much of a “USA #1” type of movie. Megan’s a big New York Yankees fan so that needs to be mentioned in pretty much every scene and can get annoying. But this is also about the effects of war, post-traumatic stress disorder for both man and dog, and that is not about patriotism. Megan says it’s about love, and she herself also says that’s very cheesy. That is mostly kept to a minimum. It’s just about Megan and the bond between Megan and Rex. Eleven years ago I watched the cute Disney movie Eight Below starring the late Paul Walker; at the time I thought it was cute. What I didn’t know then was that the emotional strength between man and dog would give it lasting power. 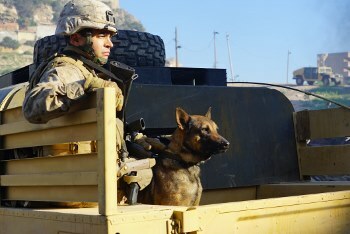 Megan Leavey has more to say than Eight Below, and it’s a lot heavier than a Disney movie, but it’s cute and it definitely has an emotional strength to it that should hopefully give it lasting power.